The Australian Sail Training Ship 'Young Endeavour' will call on Cape Town between 18 and 24 November. View the majestic sailing ship at the open day at the V&A Waterfront on 21 November 2015. The stop at Cape Town harbour will conclude the penultimate leg of its world voyage as the visit to South Africa is part of a 12-month circumnavigation of the world – the vessel’s first such deployment in over 20 years. The vessel departed Rio de Janeiro en route to Cape Town on 24 October and will, after the welcome respite of a few days 'rest' in the Mother City, set sail for Fremantle in West Australia on the final leg of its journey on 24 November. The voyage included the ship’s participation in Anzac Centenary Commemorations in Gallipoli, Turkey in April 2015 and representing Australia during the 2015 International Tall Ship Races in the North Sea. The square-rigged tall ship was the gift given by the United Kingdom to Australia, on the occasion of the Bicentenary in 1988 when 200 years since the arrival of the first fleet of British ships in Sydney was commemorated. 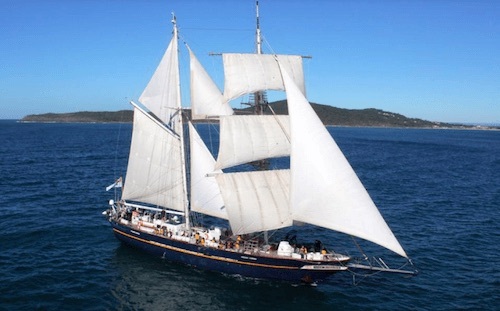 Although operated by the Royal Australian Navy (RAN), the sailing ship is primarily used to provide sail training to Australian youth through the Young Endeavour Youth Scheme. The vessel's dimensions are impressive with 44m in length with a 32m mainmast and ten sails! The ship is manned by 12 RAN personnel and 24 youth sailors. Since 1988 the Youth Scheme, in partnership with the Australian Government and the RAN, has provided challenging training voyages for more than 12,000 young people, and has hosted a further 10,000 guests from organisations supporting youth with special needs. For over 25 years, the Youth Scheme has been recognised internationally as a leading youth development program, with experience indicating that young people reap enormous benefit from the sail training program - and in turn, the Australian people also benefit as participants recognise their potential to make positive contributions in our communities. Members of the public are encouraged to take advantage of the rare opportunity to view this spectacular vessel in all its glory. What's on in Cape Town? In addition to the bilateral engagement with the South African Navy during its port visit, the ship’s crew will participate in community outreach/development activities in Cape Town facilitated by the High Commission. They will also host an open day at the sail training ship.